Gary Russell Jr. (29-1, 17 KOs) used his speed and high work rate to pound out a 12 round unanimous decision on Saturday night against his the tough Joseph Diaz Jr. (26-1, 14 KOs0 at the MGM National Harbor in Oxon Hill, Maryland. Diaz, 25, gave it his best shot, but he wasn’t consistent enough and he didn’t throw enough shots to give himself a chance to win. The 29-year-old Russell built up an insurmountable lead in the first half of the fight. There was not much Diaz could do with the wide lead that Russell Jr. had complied. Diaz tried to come late, but it wasn’t enough for him to get the decision. The judges scored the fight 117-111, 117-111 and 115-113. The 117-111 scores were fair. If Russell had wanted to, he could have won a lot wider. He got lazy once he built up a huge lead in the first half, and he just sat on it in the second half, doing the minimal and controlling the desperate Diaz with his jab and speedy combinations. In the end, Diaz was too slow, too heavy and too limited for him to win the fight. It might be a good idea for Diaz to move up to super featherweight and fight in a division more suited to his body. Diaz is too big to be fighting at featherweight, and his size makes him slow for the division. Diaz did have his moments in the fight in in the last four rounds. He put a ton of pressure on Russell Jr., and he was able to land a lot of hard body shots. Diaz was coming on well in the last quarter of the fight, but he needed to do more than just win rounds. He needed some knockdowns and/or a knockout for him to win, and he wasn’t able to hurt Russell. The 25-year-old Diaz wasn’t ready for a fighter as advanced as Russell Jr. Both guys are U.S Olympians, but Russell Jr. was clearly a better fighter all around than Diaz. What separated the two fighters tonight was the speed of Russell Jr. and his high work rate. When Russell was throwing 90 shots per round, Diaz was lucky if he was able to throw 20. With that kind of a difference in punch output, you’re not going to win too many fights if you’re Diaz. He didn’t have the hand speed or the engine to throw 90 shots per round. He’s not that kind of a fighter. Russell was bouncing left hands on the head of Diaz all night long, and landing a lot of jabs. Russell’s primary weapon tonight was his jab, and Diaz was powerless to stop it no matter how hard he tried. There were a lot of positives in Diaz’s performance tonight. He showed good power when throwing to the body, and he stayed composed and didn’t stress out when he fell behind in the first half of the fight. A lot of fighter would have mentally quit, but Diaz kept fighting hard without giving up. Russell Jr. did a good job once he stopped trying to slug with Diaz, and instead choosing to box him. When Russell Jr. started moving a lot in the middle rounds, it left Diaz Jr. helpless to get his shots off. He needed Russell Jr. to be stationary for him to throw punches. 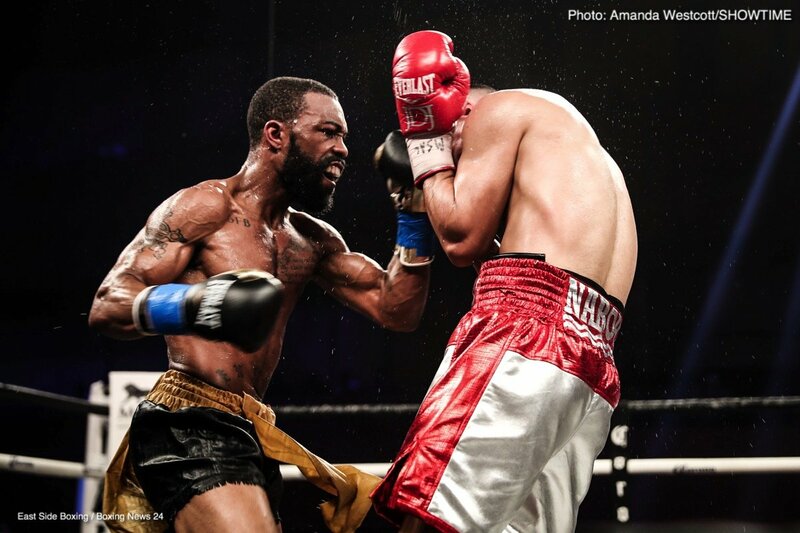 You are here: Home / Boxing News / Results: Gary Russell Jr. defeats Joseph Diaz Jr.